The official start of spring may have been a couple of weeks ago, but for me it’s the clocks going forward that properly signals the beginning of my favourite season. With fruit trees bursting into gaudy blossom, delicious lambs gamboling in the fields and the evenings getting increasingly longer, the arrival of spring is something to celebrate. With this in mind, it seems like a fitting time to share with you five fabulous cocktail recipes that I’ve been honing over the last month or so. I’ve concentrated on fresh flavours and simple, seasonal combinations in each of these drinks. They’re mostly variations on traditional favourites, given a bit of a local twist which I hope you’ll appreciate. An added benefit is that you can buy all the ingredients in Clarendon Park, including a few pre-mixed bottled drinks which provide sneaky shortcuts to making your cocktails super-tasty. All measurements are approximate – you can adjust the ratios to your taste as you go along. 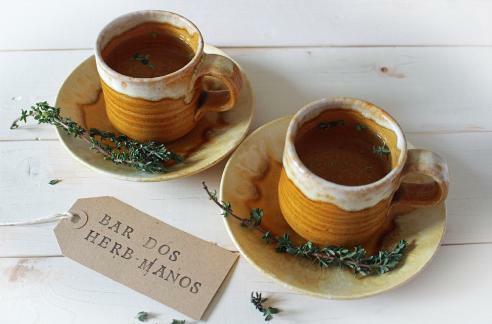 Each recipe will give you around four drinks, depending on how big your glass is and how thirsty you are. Please drink responsibly. Or get trashed and dance on the table – it’s entirely up to you. I had a fabulous cocktail in Bar Dos just after Christmas. It was called Bar Dos Tea and consisted of gin, earl grey tea, lemon and sugar syrup. At the time of writing it’s still on the specials board so do give it a try next time you’re in there – the chilled bergamot-infused tea combined with citrus and a boozy hit of gin is a winner. Another thing I love about Bar Dos Tea is that it’s served in a cup and saucer, which is a cutesy vintage touch which really appeals to me. A few months ago I bought a gorgeous retro cup and saucer set from Oxfam on Queens Road – perfect for adding a bit of hipster charm to this refreshing thyme lemonade cocktail. If the idea of making your own syrup strikes you as a bit of a faff, don’t be put off. It’s such a simple process and you can infuse pretty much anything in a half-and-half mixture of sugar and water. The resulting syrup lasts for up to a month in the fridge and can be used in desserts as well as all sorts of drinks. To make the syrup, put the water, sugar and thyme into a saucepan and boil it until the sugar has dissolved. Take it off the heat, put a lid on and let the thyme infuse for about ten minutes. Then take the thyme out and let the syrup cool right down before putting it in the fridge. When your syrup has chilled, make the cocktail by mixing all the ingredients together and pouring the resulting drink into cups over crushed ice. A few bits of fresh thyme floating on top will make it annoying to drink but they look pretty. Using a still drink as a mixer in this cocktail instead of soda water will give you a more subtle and less burpy alternative. Firefly tonics work perfectly for this purpose – grab a bottle next time you’re in Fingerprints and give it a try. The kiwi, lime and mint one is a personal favourite. It’s the Belvoir elderflower cordial used in this cocktail which gives it a fresh and fragrant zing. Pick up a bottle in Green and Pleasant on Queens Road – it makes a lovely ‘posh squash’ just mixed with water but it really comes into its own where cocktails are involved. 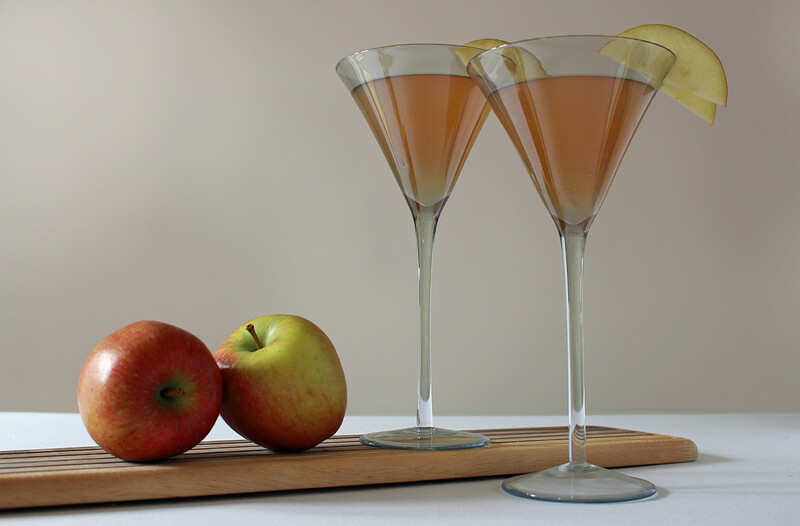 If you’ve got a juice extractor or plenty of time on your (sticky) hands you can make your own apple juice for this recipe. Otherwise Bertrams organic apple juice, sold in Fingerprints, is a great option. Best served in a martini glass, this is a seriously classy cocktail. Pour the ingredients, along with plenty of ice cubes, into a cocktail shaker. Shake and strain into a martini glass, and garnish with a slice of fresh apple. If you haven’t got a cocktail shaker you could use a big jam jar or a sports bottle. Or just buy a cocktail shaker (£8.99 from Argos last time I looked – that’s got to be a good investment). Feeling a bit James Bond? Replace the gin with vodka for an apple martini 007 would approve of. The mojito is my favourite cocktail and this green tea alternative is a real thirst-quencher. Make your own green tea brew and sweeten it to your taste, or take a short cut and pick up a bottle of lemon and green tea Mangajo from Fingerprints. Andersons’ Sweets and Ice Cream used to sell a handy range of flavoured sugars. I bought a little bag of lime flavoured sugar and used it to decorate around the edge of the glasses – it makes it look really fancy. Sadly Andersons is no more so you’ll have to look elsewhere. Alternatively, you could visit the current tenants of 16 Queens Road, Dr Protein, and decorate your glasses with some kind of protein supplement powder. It would certainly be a talking point. Rub a segment of lime around the rims of the glasses and dip them in the lime sugar before filling them three-quarters full with crushed ice. Rip the mint up roughly then bash it a little in a pestle and mortar or similar until the leaves bruise and start to release their flavour. 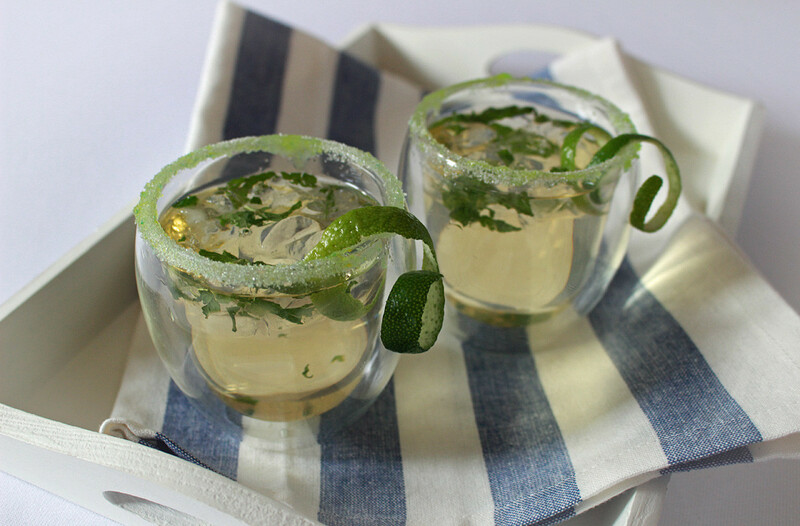 Mix the leaves with the liquid ingredients and pour into the glasses. Garnish with pieces of twisted lime rind. You could substitute the green tea in this cocktail for any type of fruit or herbal tea. I’ve got a box full of fancy teabags I’ve pinched from hotels which come in very handy for creating bespoke cocktails like this! Making the rhubarb syrup for this mimosa-style cocktail is a little time-consuming but it’s worth it – the combination of sharp rhubarb and sparkling wine is delicious. It’s also a great way to use up a glut of home grown rhubarb. I used prosecco bought from The Offie on Clarendon Park Road in this cocktail. Walking into The Offie was an intimidating experience because of the sheer choice available, with each wall of the little shop lined with weird and wonderful brews. Thankfully, Murray, the proprietor, was on hand to offer advice, and this lovely bubbly turned out to be the perfect fizzy friend for my fruity concoction! Sweets are perhaps not the natural choice as an accompaniment to a champagne cocktail, but then again why not? I stocked up on a few rhubarb and custards from Andersons’. Combine the rhubarb, sugar and about a pint of water in a saucepan. Bring it to a boil over medium-high heat and cook, stirring occasionally, until the rhubarb has broken down slightly (about ten minutes). Remove the pan from the heat and add the mint, let it cool for a minute, then strain. The mixture should be syrupy – if it’s too watery, return it to the saucepan and continue cooking until it’s slightly reduced. Cover the syrup, let it cool, then put it into the fridge to chill. 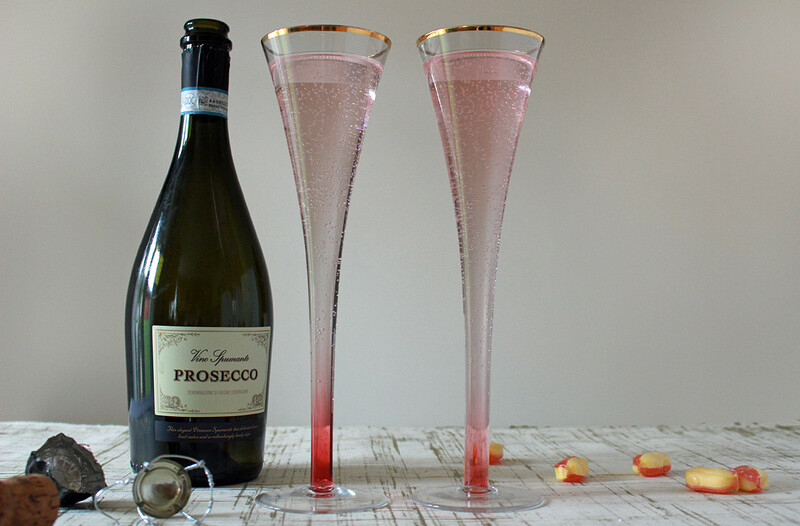 Divide the rhubarb syrup between four champagne glasses and top with the prosecco. This is another syrup which lasts for a while in the fridge and could be used for all sorts of different purposes. It’s absolutely gorgeous mixed with soda water for a seriously refreshing and elegant daytime drink. It also works brilliantly as a topping for desserts, especially ice cream. I bought all the fruits and herbs used in these cocktails from Parsons, greengrocer on Queens Road. Whenever I visit this shop I’m amazed by the freshness and great value of the products and it seems fitting that I dedicate my final cocktail to it. This cocktail is similar to sangria, but it’s made with white wine instead of red. 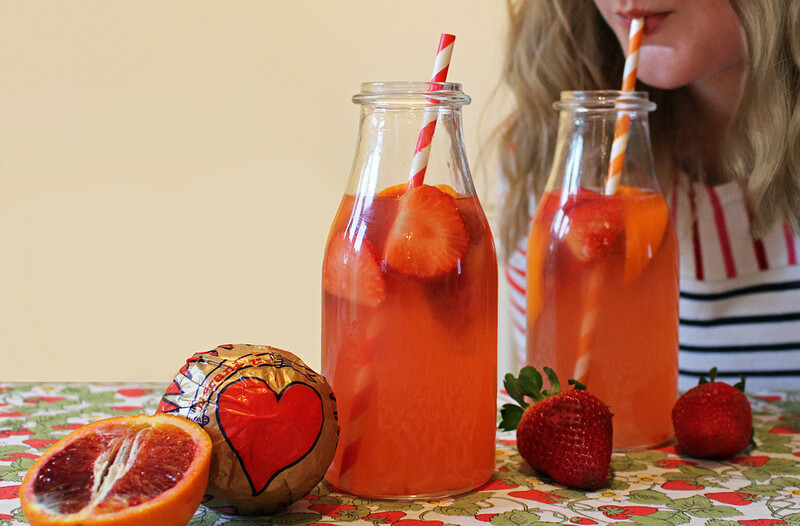 I used blood oranges which made the punch a vibrant red and were a nice colour-match for the fresh strawberries. If you can’t be bothered to juice your own oranges I suggest you pick up a few portions of freshly squeezed stuff from Salvador Deli. Their OJ is just gorgeous and a million times better than anything you can get in a carton. This punch is really quick and simple to prepare which makes it ideal for parties – you can whip up a big jug full in a couple of minutes. An added incentive should you need one – this cocktail counts towards your recommended five portions of fruit and veg per day. Chop up the fruit and divide it between the glasses. Add the orange juice and white wine. Drink. Repeat. The joy of this cocktail is that you can use any type of fruit you like and any combination of different fruit juices. Adjust the juice to wine ratio depending how boozy you want it to be. You can also replace the wine with cider for a sparkly apple tang. There’s a lot of entertainment to be had in cocktail making; from choosing unusual ingredients to playing around with flavoured sugars and syrups and fashioning fancy garnishes. I hope you enjoy these recipes and have fun tweaking them to make your own creations – let me know what you come up with! ooh, what a lovely post! They all look rather lovely, apart from the tea,…don’t drink tea, even green tea! however, I adore prosecco and have rhubarb growing on my lottie , so I think that’s the drink I will make first!